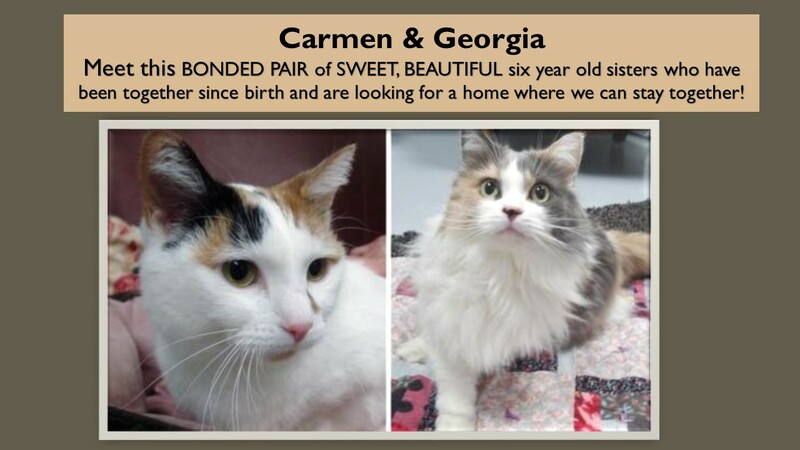 Pets Of The Week: Carmen & Georgia, a BONDED PAIR of sweet, beautiful 6 year old sisters who have been together since birth & are looking for a home where we can stay together! We were in a very loving home until, sadly, our owner became ill & could no longer care for us. We are very gentle, friendly & easy to handle. We are used to a quiet home, although have been around kids & even a nice dog & did fine. 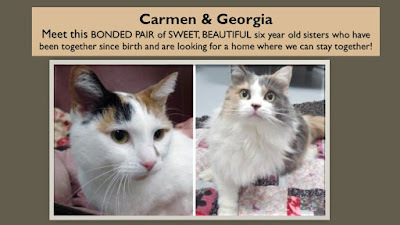 Carmen is an adorable, short hair calico who is mostly white with pretty markings. Georgia is a gorgeous, medium hair calico who is front declawed. Carmen is not declawed. Imagine the love & joy we will bring into your home and heart!